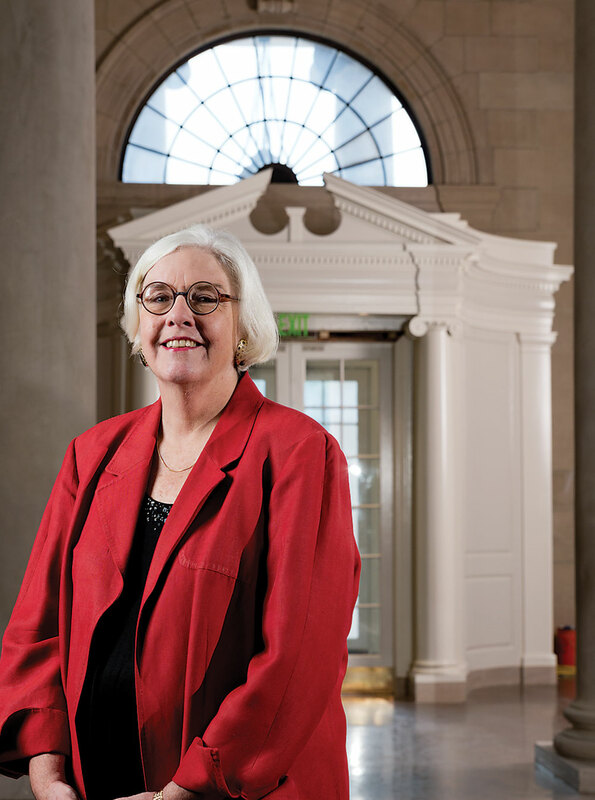 An inside look at the BMA's 100-year relationship to Baltimore. 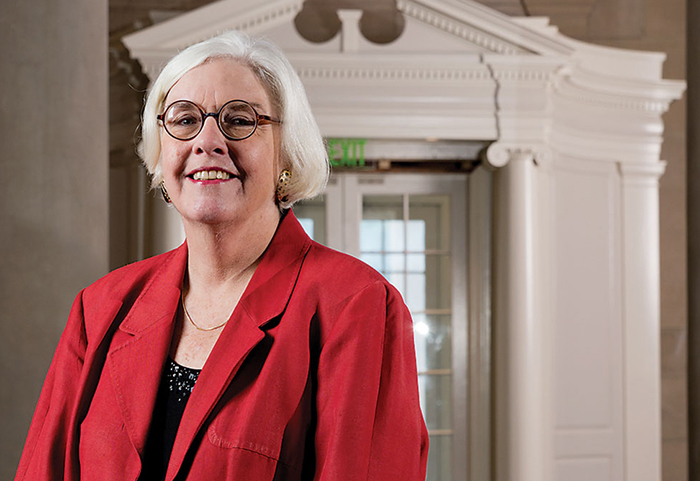 An inside look at the evolution of the BMA’s 100-year relationship to Baltimore. The fall arts season is packed with exceptional events—check out our Editor’s Picks for proof—but The Baltimore Museum of Art’s 100th anniversary deserves particular attention. The museum was founded in 1914 with an eye toward bringing art to the community, and, basically, that mission hasn’t changed. But over the past century, notions of art and community have changed profoundly, and the BMA has adjusted—sometimes, ahead of the curve; other times, struggling to keep pace. Though its course may have been charted by a handful of determined directors and prescient curators and collectors, its evolving identity suggests something grander at work, something inextricably linked to the city’s history and how we view ourselves. 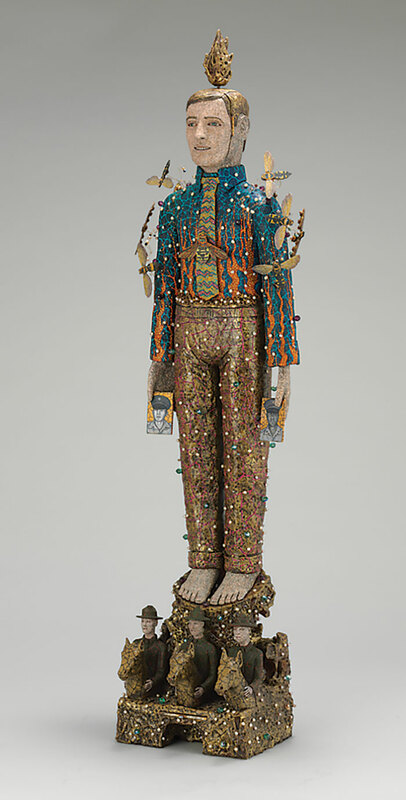 In fact, the BMA’s legacy is as much about Baltimore as it is about art. Carl Carver, standing in front of the BMA’s Grand Front Entance, which reopens in November. Photography by Mitro Hood. The survey went out in the fall. 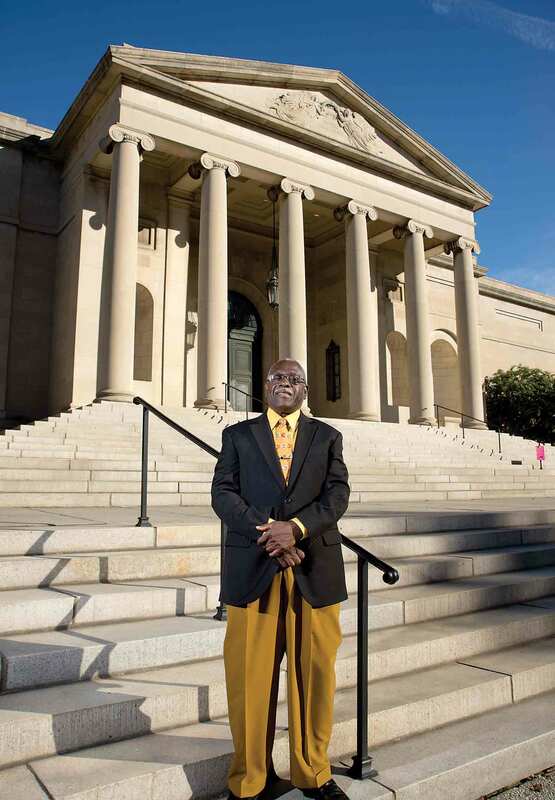 Part of an ambitious community-outreach initiative spearheaded by The Baltimore Museum of Art’s [BMA] board of trustees, it queried hundreds of local businesses, community leaders, stakeholders, and even the Boy Scouts about their relationship to the museum and what they wanted from it going forward. It included questions like: How often have you visited? What appealed to you? Do you believe the museum should devote itself primarily to the work of living artists? Do you believe the museum should show more commercial art? What types of exhibitions would you like to see? The range of responses shows the challenges faced by an institution trying to accommodate various constituencies and reach others, while simultaneously acknowledging its history and moving forward. It’s all the more poignant when you consider that this particular survey was conducted in 1937. Looking at that history, it’s striking how the museum barely resembles the repository of objects it used to be. In other ways, it hasn’t changed at all. Anthony van Dyck’s 17th-century painting, Rinaldo and Armida, a piece Carver rehung “a few times” during his long stint at the BMA. Baltimore Museum of Art. BMA 1951.103. 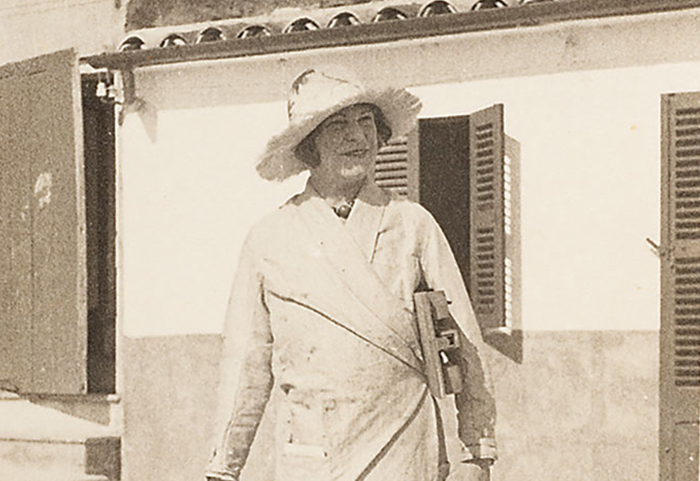 Carver had no background in art before coming to the BMA. Originally from Elizabeth City, North Carolina, he had been a baker at Silber’s on Reisterstown Road and at Bond Bakery at North Avenue and Harford Road. He also worked for awhile at a body shop on Monument Street. Powell, who was especially particular about presentation, would oversee the installation or leave detailed instructions with Carver. “She insisted that everything be perfect,” he recalls. “I’d have the paintings on the wall, and she might say, ‘Carl, this one should be a little to the left." 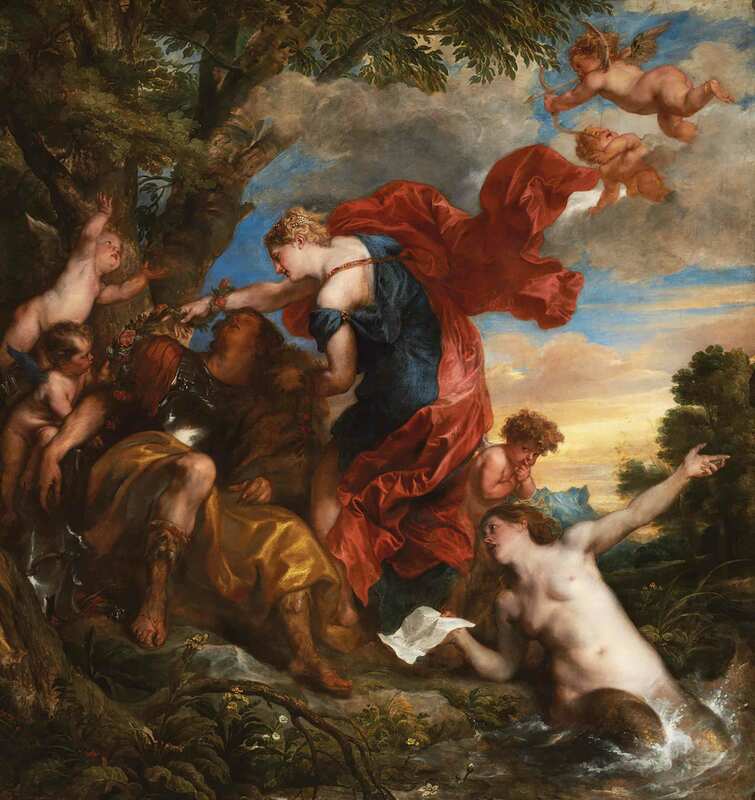 He casually mentions re-hanging the Cone Collection three times and Rinaldo and Armida, Anthony van Dyck’s 17th-century masterpiece, “a few times.” When summer temperatures exceeded 90 degrees, he would take Old Master paintings off the Jacobs Wing walls and move them to the Cone Wing—for years, the only air-conditioned area in the museum—for safekeeping against the heat. Guards sometimes fainted in the stifling gallery. Carver transferred to security, before becoming assistant building superintendent and facilities manager. He can tell you where the roof leaked, which director knew all the guards’ names, and which pieces were stolen over the years (surprisingly few for a collection of 90,000-plus objects). He can point out the vase that was toppled by an electrician’s cart and the abstract masterpiece that got stepped on and needed repair. During his stint as a night watchman in the early-1970s, he says a fellow guard, spooked by co-workers’ ghost stories, brought in a German shepherd to accompany him while making rounds. “We had to let that guy go,” says Carver, who officially retired in 1997, but later returned to work as a security guard until 2012. 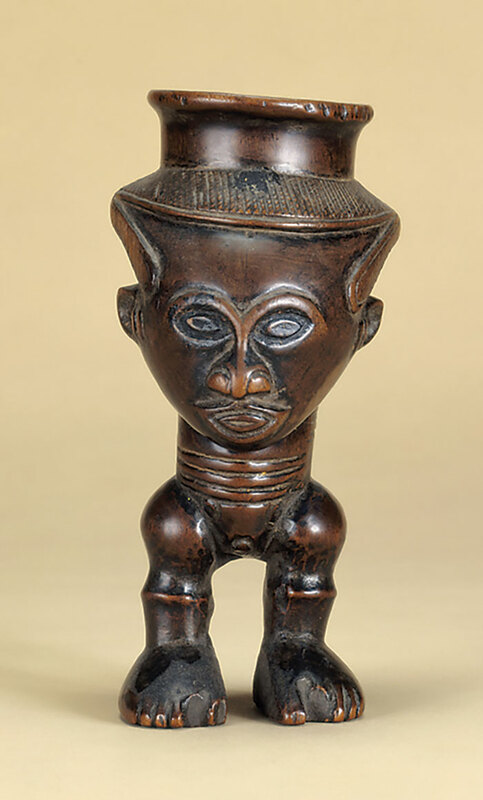 The museum’s Kwanzaa celebrations, performances by groups like Sankofa Dance Theater, and the Joshua Johnson Council’s outreach to the African-American community also helped. “Inside the museum, it finally started looking like the city outside,” says Carver. The longtime BMA curator selects the “non-Cone” pieces you shouldn’t miss. Among the earliest pieces of furniture that will appear in our new installation of the American Wing are several “High Chests” of enormous scale. These are formidable pieces of furniture, drawer after drawer stacked so high that to reach the top drawer you would need a ladder—a good place to hide things from prying eyes. But, my favorite of these chests is smaller and delicate by comparison. First we see the serpentine legs that support the chests. 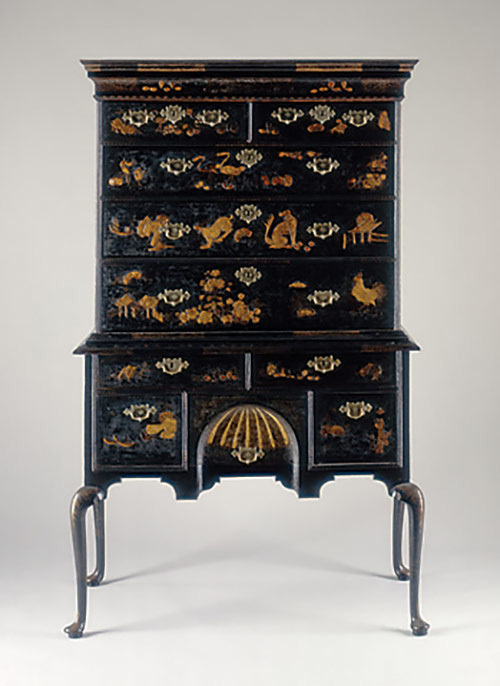 Surely they cannot support the weight, but as your raise your eyes, instead of a display of heavy drawers and carving at the top, the entire surface of this chest is covered with an array of animals, real and imagined, grazing, resting, as if in nature. The surface has become a painting and the impression we get from these fanciful decorations is one of lightness. These designs have been applied to the surface of the chest by William Randle in about 1733. He was known as a “Japanner” because of the technique he utilized, working with gesso and paint in the manner of Japanese and Chinese artisans. He was also inspired by the images he found on ceramics imported from the Far East, objects you might expect to see in a city with a major port such as Boston where Randle worked, or in Baltimore, where this beautiful cabinet eventually found its home. A fragile object indeed, there are only 40 or so examples remaining today. 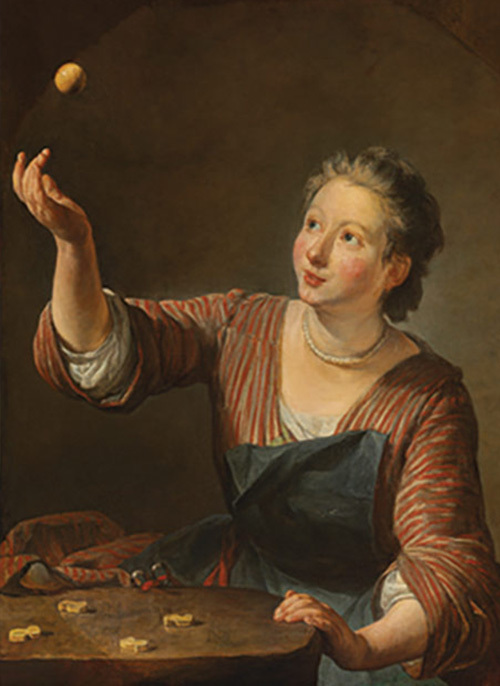 I seek out Chardin’s paintings when I simply want to delight in how an artist applies paint to canvas. We are so fortunate to have a fine example at the BMA so relying on memory simply won’t do. Up to the galleries I go. The surface of Chardin’s paintings seems so dry as if the paint was pulled from the bristles in the course of gentle strokes. What a subtle colorist he was, each hue orchestrated within a perfectly balanced whole, bathed in what feels like an afternoon light. His careful observation of detail brings certain features to life, whether capturing the weight and texture of materials like fabrics, or through a touch of paint to highlight a small object like a pin in the woman’s apron, or the handles of the scissors. My eye is caught by the ball just tossed into the air. It is held for just a moment in the light as if it were a rotating planet in the solar system caught by the sun. Such eloquent realism inspired artists of the next century but this is a picture of the 18th. 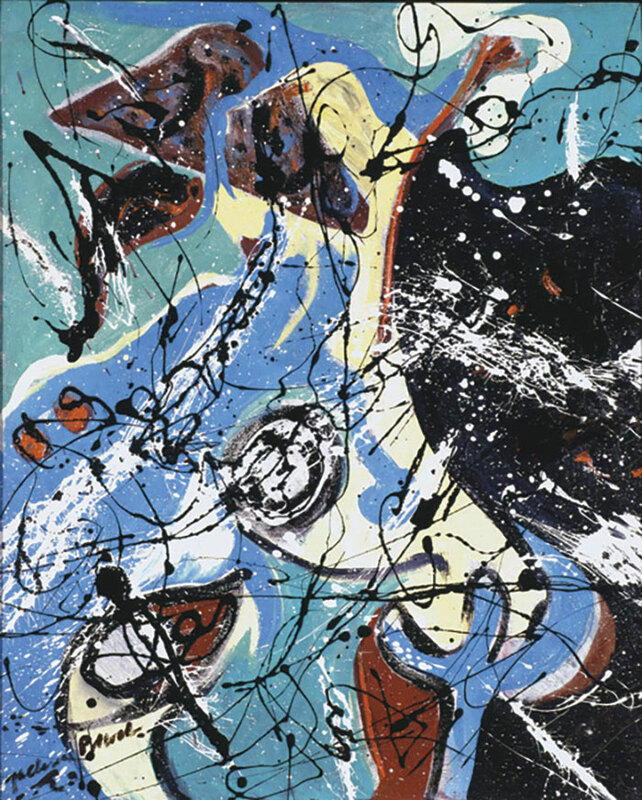 Thanks to our great collector of modern art, Saidie May, Baltimore has one of Miro’s greatest paintings from the 1930s. Portrait No.1, depicts a monstrous female figure with an enormous head that seems to loom over the viewer. 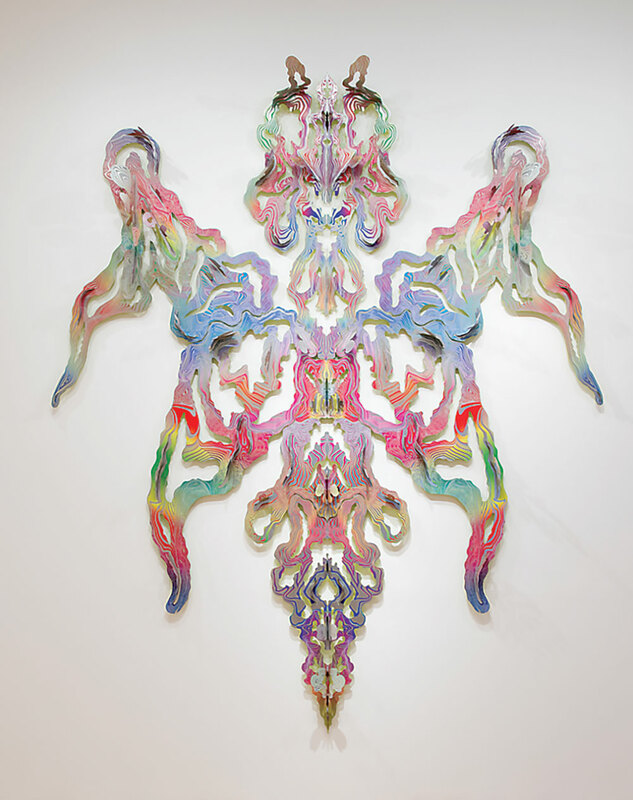 Childlike renderings of unidentifiable creatures coexist with simplified and dislocated features of the woman’s body. Hollywood hasn’t come up with anything this scary. Miro painted this when he was living in exile in France to escape the violent Spanish Civil War. 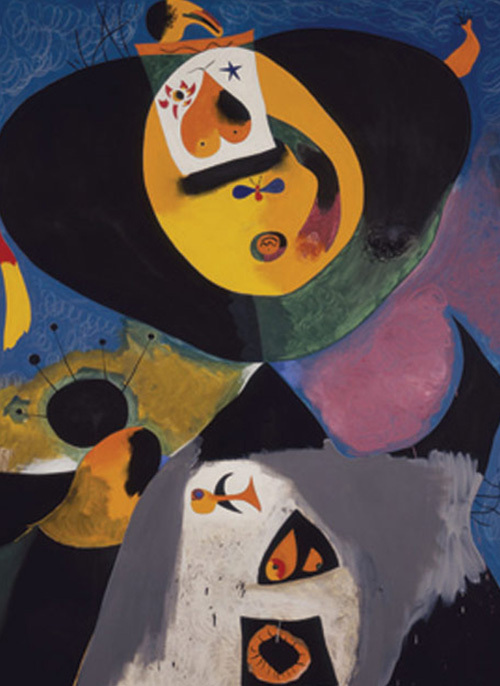 General Franco, a vicious dictator, and his fascist forces were poised for victory, and as a supporter of the Republican cause, Miró was well aware of the atrocities occurring in his native land. This accounts for the sinister quality of Portrait No. I. The ribbon in her hair probably refers to the Spanish flag, a fleeting indication of hope for the future of his country. I like art that raises questions not easily answered. Is this some sort of abandoned device for making a painting or are we looking at a work of art? The rulers that scraped the surface of the wet grey paint to form the semi-circular shapes, remain in place having fulfilled their functional purpose but now they take on their own visual role in the artist’s composition. 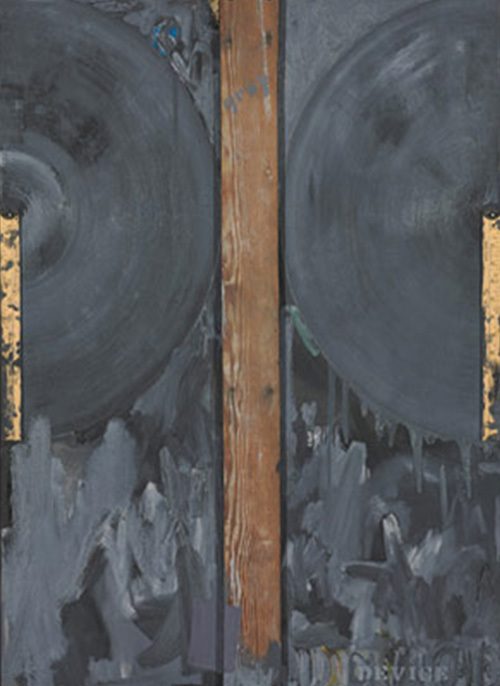 The drips from a heavy application of dark grey paint lightened in places with white, have dried in place, and the wood slat dividing the canvas is now discolored with age. The passage of time is something to be aware of in this artist’s world, and this happens to be a painting Johns has asked us to lend to many exhibitions. What we see acknowledges the making of this painting but what of the artist. 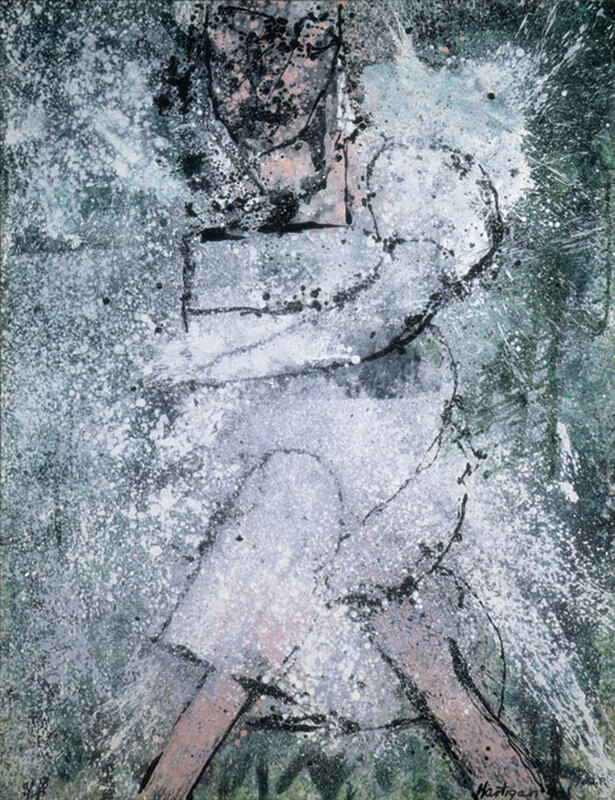 Johns has stenciled “DEVICE” on the painting and also “GRAY” to offer verbal affirmation of what we see but in doing so asks the question, “is explanation required”? There is certainly much to be seen for beyond the ideas Johns is playing with, he is a gifted painter with a deft touch. Johns created this object, this painting, 52 years ago and it still engages us with questions about its meaning, putting for topics for a dialog between the art of the past and the art of the future. What a portrait of self-confidence, and a bit seductive, too. Remember, the artist is seeing himself in a mirror, but as we see him, his eye seems to follow us, seeking our admiration. He saw himself with the satisfaction of Narcissus admiring his reflection. Though his attention is now directed towards the viewer, we see evidence of his trade….the drawing he holds with his left hand to the right of the scene. This would seem to be an homage to drawing, and he was a master at that. We have several drawings by West in the collection and I am a drawing curator. But at the time, everybody would have recognized this drawing as a sketch for his most famous work, The Death of General Wolfe, painted around the time of this self-portrait. Though West was born in America he sought and gained his fame in England where he was greatly admired, especially in academic circles. 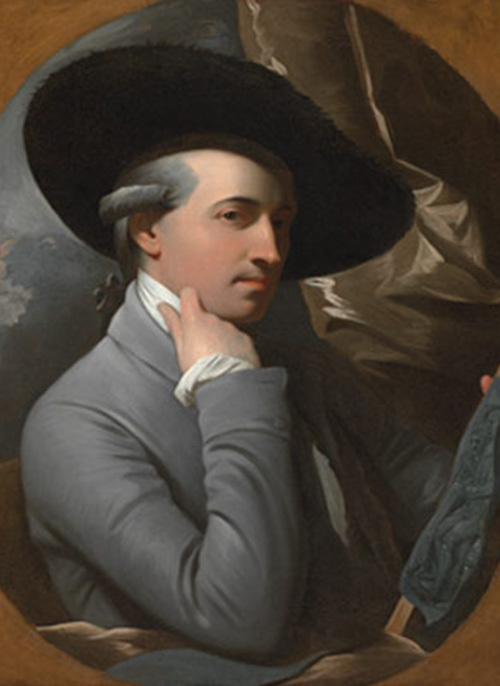 He was the President of the Royal Academy, succeeding the great Joshua Reynolds, also represented in our collection. West’s art, both portraiture and history painting, was tremendously influential for American artists. This is one of his very best portraits, just perfect in every aspect he intended, a testament to the superiority of his practice of art and his example for other artists of his time and beyond. It started with one piece of art—a William Sergeant Kendall painting, Mischief, donated by Dr. A.R.L. Dohme. The founders were confident more would follow and arranged for the donated art to be stored at Peabody Institute until a building was obtained. In 1923, the BMA found a temporary home at 101 W. Monument Street, the former residence of Mary Elizabeth Garrett. There, the museum presented paintings, sculpture, etchings, furniture, and metal-work exhibitions. Admission was free, and more than 25,000 people came to the museum in the first six months. The BMA also appointed its first director, Florence Nightingale Levy, a former curator at New York’s Metropolitan Museum of Art. Levy surveyed fellow directors from New York to Houston, gathered critical information about operating costs and levels of city and state support, and established credibility that made the move to a permanent location all but inevitable. Designed by John Russell Pope (who later designed the National Gallery of Art and the Jefferson Memorial) and constructed on land donated by The Johns Hopkins University, the neo-classical building opened in 1929. As predicted, it was something of a build-it-and-they-will-come scenario: donated art steadily trickled in, and it wasn’t long before the museum needed to expand. 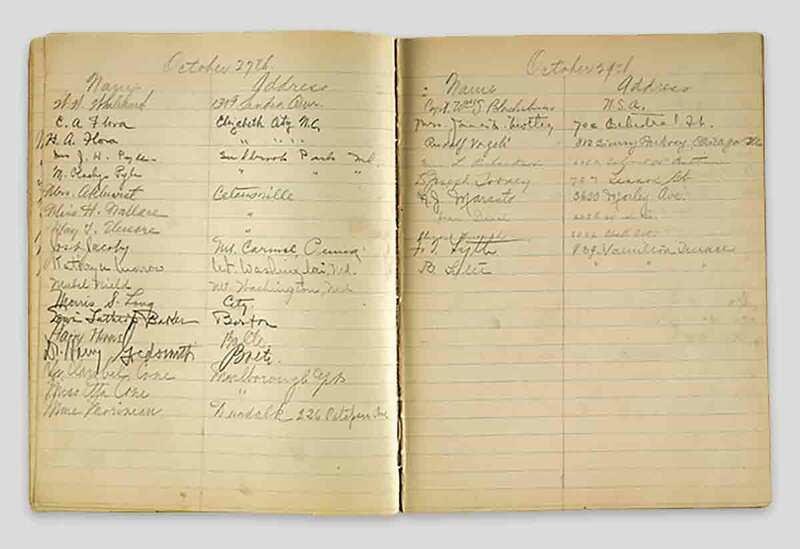 Gallery view at opening of Pope Building, 1929; Arnold Lehman, Adelyn Breeskin, Charles Parkhurst, Trude Rosenthal, and Tom Freudenheim, 1983; Visitor registry for first Baltimore Museum of Art exhibition, signed by the Cones, 1923. To this point, it was mostly a repository for objects—objects meant to educate and inspire—and a venue for lectures and musical performances, which proved popular. In fact, more than 1,200 people turned out for a concert of religious music in 1933. That same day, over 200 people were turned away from a music-appreciation lecture. Fall events marking the BMA’s first century. The glamorous gala will include great music, lavish decorations, and fine food. Word is that it’s already sold out, but you can get on the BMA’s waiting list and hope. November 15 | 6 p.m.-12 a.m.
A more rockin’ affair, the party features dancing, specialty drinks, birthday cake, “art activities,” and a few surprises. November 15 | 8:30 p.m.-12 a.m. The time capsule embedded in the East Wing in the early-1980s will be opened and its contents examined. Visitors can then help assemble and install a new time capsule that will be opened in 2114. November 16 | 2 p.m. Opening Celebration The daylong event marks the reopening of the BMA’s historic front entrance and the renovated American galleries. There will be live music, artist demonstrations, gallery talks, storytelling, and treats for the whole family. November 23 | 10 a.m.-5 p.m.
Local artists were feeling slighted, as well. “We, the living, resent being left to work in a vacuum of indifference and neglect while so much of the dead past is exhausted [by the BMA],” the president of the Artists’ Union of Baltimore complained to The Evening Sun in 1937. The writer of the letter was Morris Louis, whose work, decades later, would become a cornerstone of the BMA’s contemporary collection. Treide responded with the extensive community outreach survey in 1937, which resulted in, among other things, a “Labor in Art” show the following year and then, in 1939, the city’s first exhibition of African-American art, which included work by Jacob Lawrence. The latter show drew over 12,000 visitors in two weeks. But what followed transcended the city limits, as breathtaking bequests brought the BMA national and international attention and upped its standing considerably within the museum community. 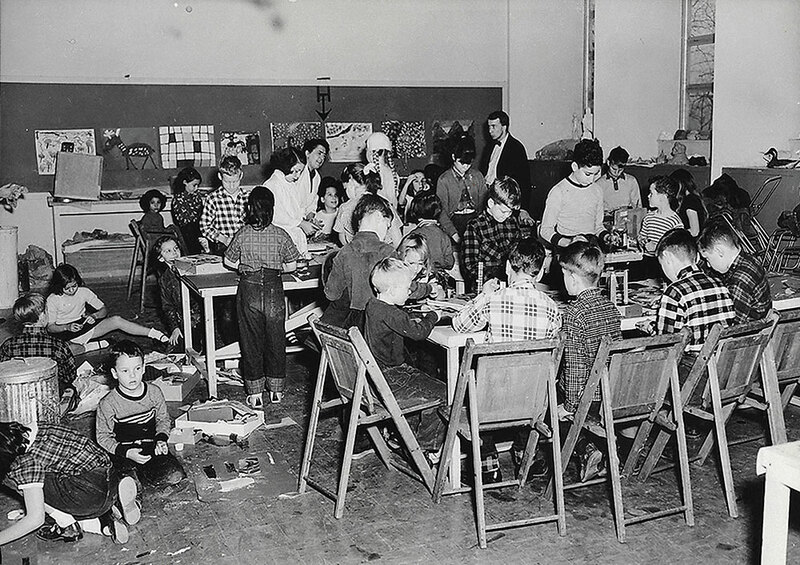 Children’s art class at BMA’s Young People’s Art Center, 1950s; Saidie May, artist and collector; 19th-century African palm wine cup from the Wurtzburger Collection. 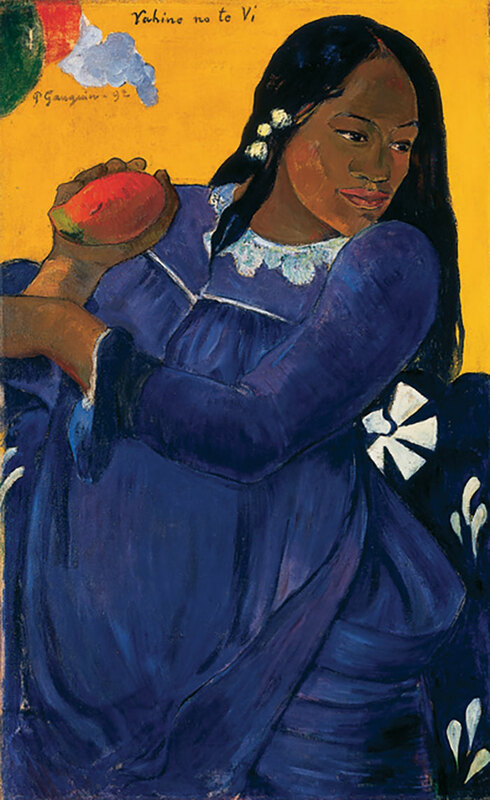 Jackson Pollock’s Water Birds was given to the BMA by May; The Cone Collection includes an extensive selection of acclaimed Matisse paintings; Gauguin’s Woman of the Mango is another Cone Collection highlight. Adelyn Breeskin and Trude Rosenthal deserve much of the credit. 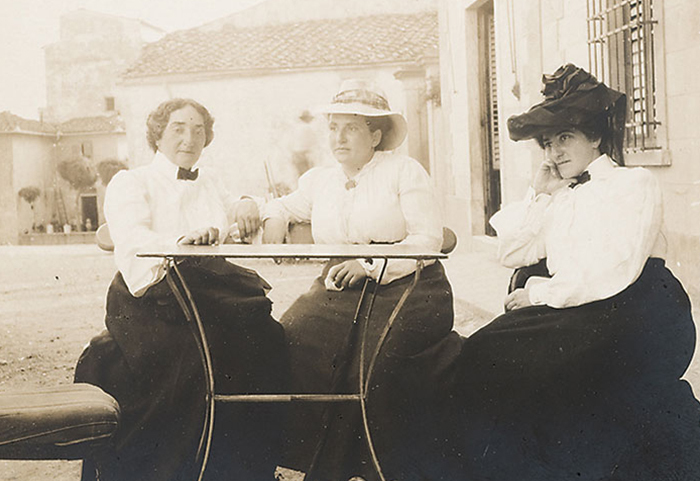 The two women are often mentioned in the same breath, and for good reason: The museum acquired its most vaunted collections during their tenures, and, in many ways, the duo shaped the BMA as we know it. Rosenthal came aboard in 1945 as research director and worked her way up to chief curator, before retiring in 1968. She was an art historian with impeccable credentials and curated the BMA’s 50th anniversary exhibition in 1964 and “From El Greco to Pollock,” which nodded to the scope of her scholarship, in 1968. The permanent collection swelled substantially on their watch. 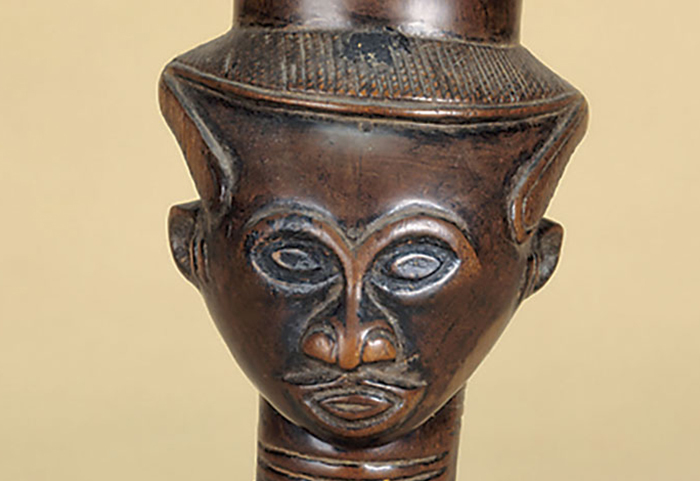 The bequests and gifts included the Jacob Epstein Collection of Old Master paintings, with van Dyck’s Rinaldo and Armida (1946); the Wurtzburger Collection of African and Pacific Islands art (1950s); the Saidie A. 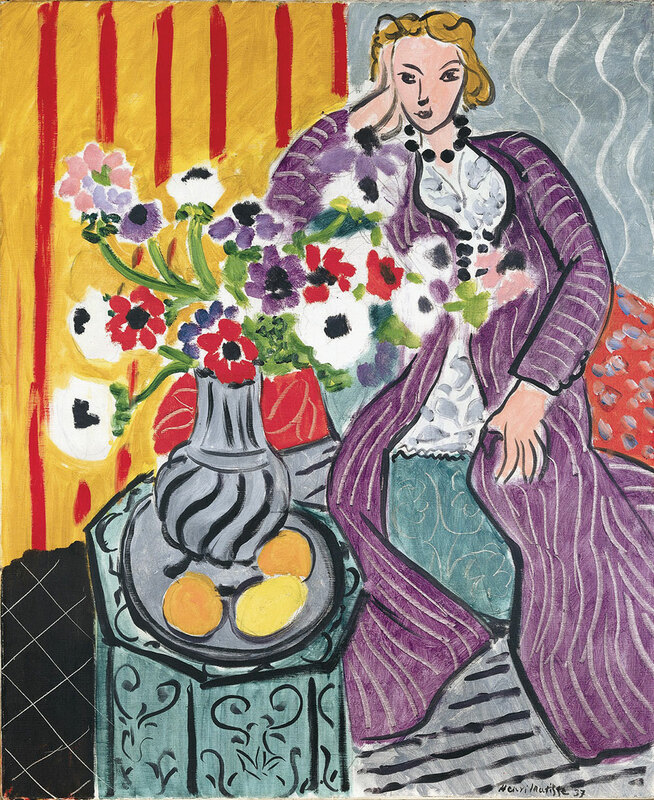 May Collection of sculpture and paintings, which consisted of everything from 16th-century bronzes to work by Marc Chagall, Piet Mondrian, and Jackson Pollock (1951); and the renowned Cone Collection (1949). “There is scarcely a single museum department . 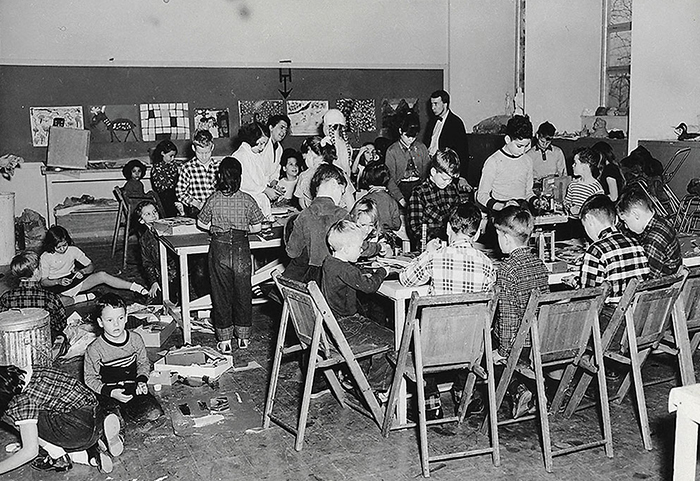 . . to which she has not contributed,” noted Breeskin at the children’s wing opening in 1950. Another speaker compared May to Johns Hopkins, George Peabody, and Henry Walters. The famed Cone sisters were more conflicted about their hometown. Claribel died in 1929 and left her part of the collection to Etta, her sister. Claribel’s will stated she wanted the complete collection to remain in the city “if the spirit of appreciation for modern art in Baltimore becomes improved, and if the Baltimore Museum of Art should be interested” in receiving it. Sensing an opening, representatives from The Museum of Modern Art, the Philadelphia Museum of Art, the Art Institute of Chicago, and the National Gallery of Art all inquired about it, and various curators and directors turned up at Etta’s apartment to schmooze and salivate over the Matisse, Picasso, Cézanne, Gauguin, and van Gogh paintings. 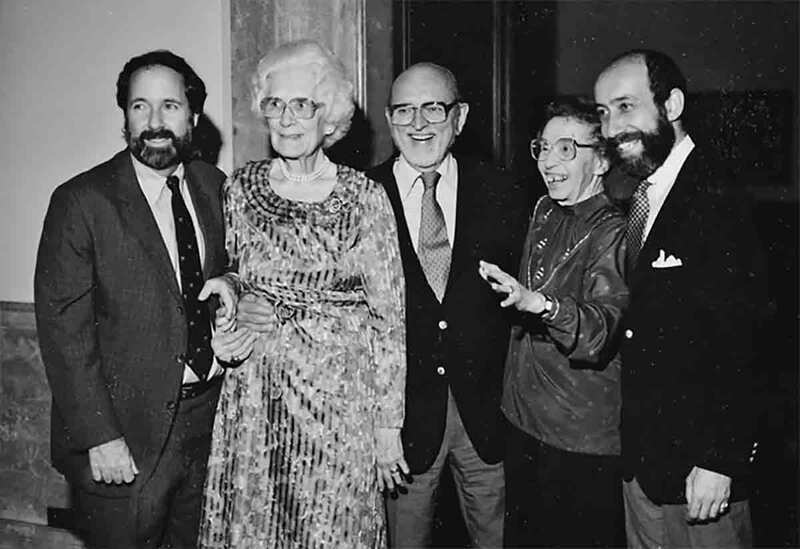 Ultimately though, Breeskin’s and Rosenthal’s personal relationships with Etta—reminiscent of their dealings with Saidie May and others—trumped such efforts. 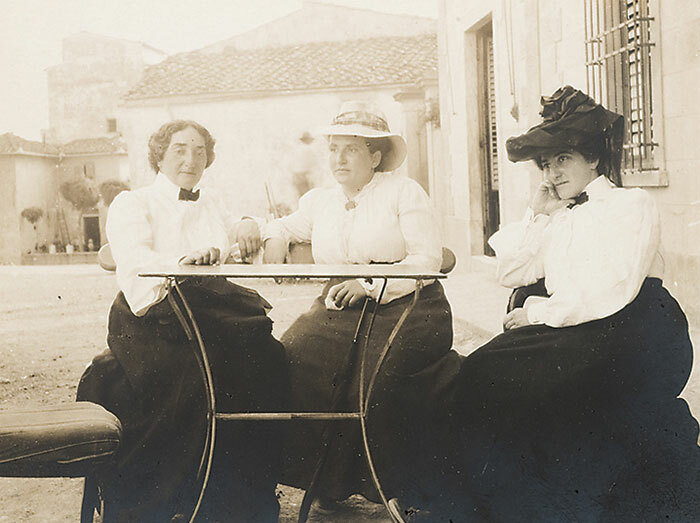 Etta consulted Breeskin and Rosenthal about purchases and sometimes asked the pair to suss out potential acquisitions in New York for her. 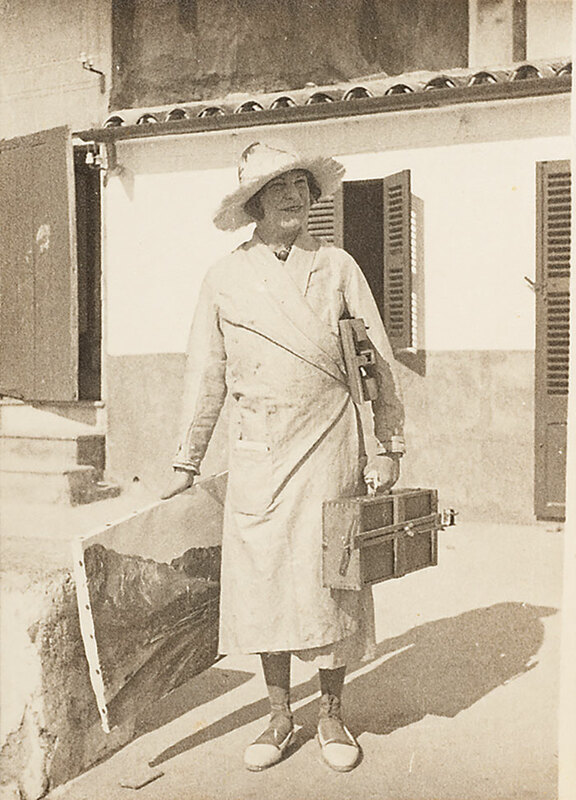 When Etta died in 1949, she left the entire collection, all 3,000 items, to the museum. 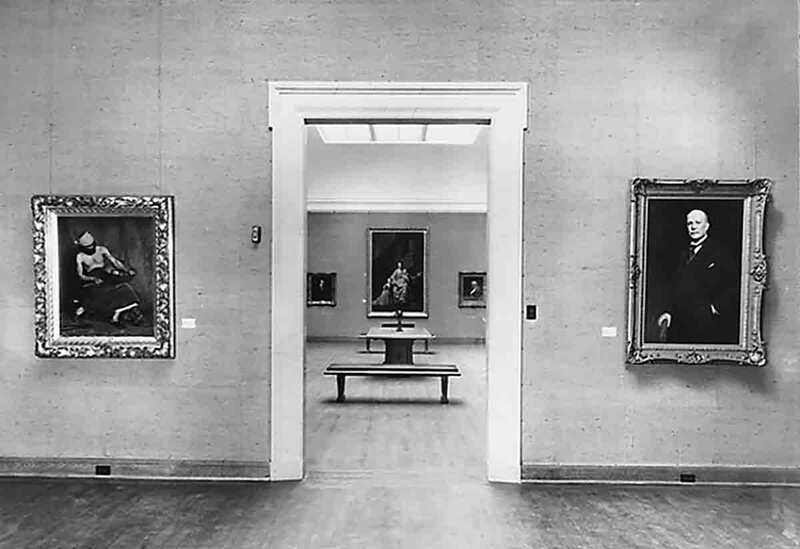 In 1957, the Cone Collection moved into a BMA wing built especially for it and assumed its position as one of the most astonishing and important art collections in the world. Since then, public perception of the BMA has been inextricably linked to the Cones’s prescient taste. “The Cone Collection quickly became what everyone associated with the museum,” says deputy director of curatorial affairs Jay Fisher, who’s worked at the BMA for almost 40 years. But as the cultural landscape shifted dramatically over the next decade, the BMA was forced to reflect on its role in the broader community. African Americans, women, and young people clamored for more of a voice in all aspects of society. Was it time for the BMA to look beyond its collections (like Treide in the 1930s) and become more outwardly focused and inclusive? Or was it above the fray? The next direction came from, of all places, Berkeley, California. He selected a pinstripe suit with flared pants, a striped shirt of six different colors, and a polka-dot tie that, color-wise, matched the shirt. Some members of the buttoned-down board were shocked—someone on the search committee even told Freudenheim they didn’t like beards—but, they hired him anyway (facial hair and all), aware of a profound need for youthful energy and new ideas. A run-down of iconic artists who have visited the BMA. Lecture and demonstration by Cunningham, accompanied by Cage, his musical director. Dance performances by Graham and members of her company. Book-signing for The Philosophy of Andy Warhol (From A to B and Back Again) in conjunction with the BMA’s Warhol exhibition. He instituted family days, emphasized community outreach, and expanded the BMA’s presence in the metropolitan area through traveling exhibitions and satellite sites at Charles Center and The Mall in Columbia. Freudenheim hired a former colleague, curator Brenda Richardson, from the Berkeley Museum to take some of those risks and expand the contemporary collection. 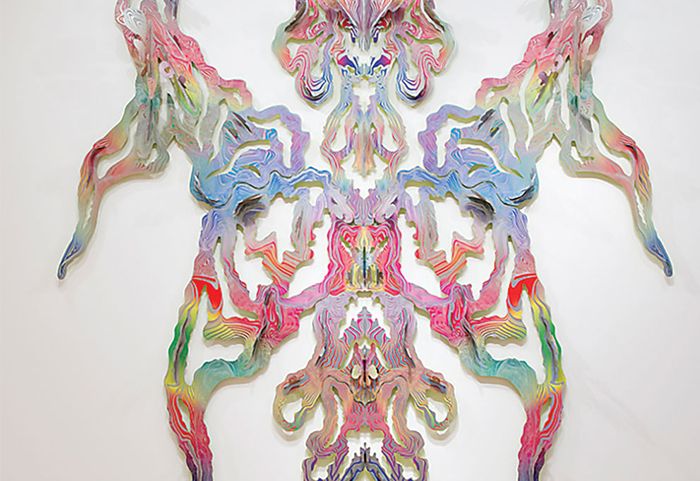 Richardson curated a succession of groundbreaking shows, including, early on, an Andy Warhol exhibition (1975) and a showing of Frank Stella’s Black Paintings (1976). Such exhibitions continued under Freudenheim’s successor, Arnold Lehman, who took over in 1979. Lehman believed the museum remained at something of a crossroads with regards to building an audience, and that it was critical to expand upon Freudenheim’s efforts. Lehman went for it. A prodigious fundraiser, he increased the endowment exponentially, pushed for a new Contemporary Wing that opened in 1994 (featuring a stunning collection of recently-acquired Warhols), and wholeheartedly supported Richardson’s discriminating exhibitions. In fact, they worked together on some shows, including 1997’s A Grand Design: The Art of the Victoria and Albert Museum. Lehman was also known for championing pop-culture fare that brought more people into the building. For every Gilbert & George or Anne Truitt exhibition, there was a show of carousel horses or the art of Dr. Seuss. “Slowly but surely, we saw positive results with regards to audience,” says Lehman. Attendance eventually tripled and membership increased nearly 400 percent. And still, roofs leaked as the building showed its age, and the local artist community continued to feel slighted. Bolger, who took over after Lehman left for the Brooklyn Museum in 1997, addressed both issues. The evidence is all around. In her office, for instance, a framed piece with the words “Forward In All Directions” dripping down the canvas hangs behind her desk. Its presence in the director’s office makes a statement in two important ways: there’s the message, obviously, and also the fact that it’s the work of a MICA graduate, Colin Benjamin.